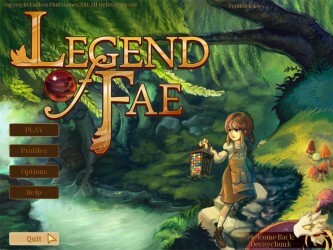 Today we will be looking at Legend of Fae, a new game from Endlessfluff games. 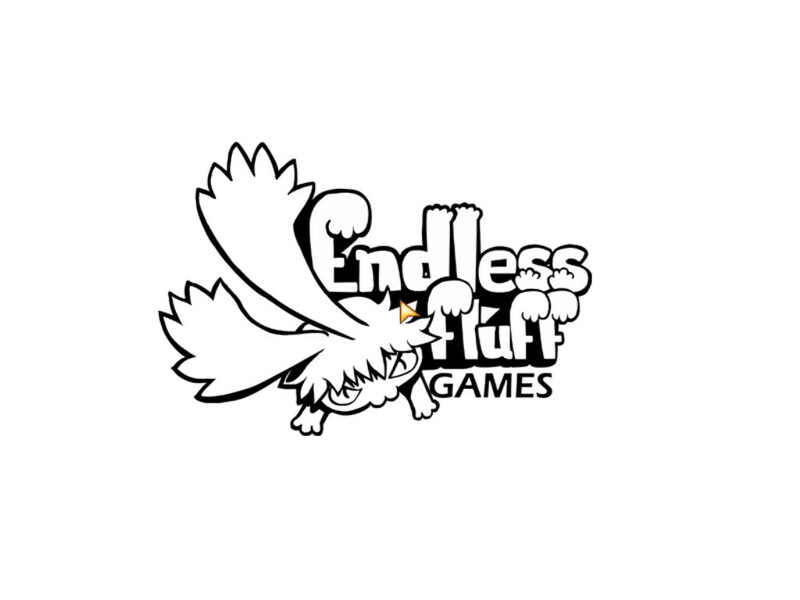 When I first looked at the Steam page for this title, I saw that the genres listed are “Indie” and “Casual” and I became confused. “Indie” is just the nature of its development, and “Casual” is just a description of its intensity. What was its actual genre? Well, after having played it for a few hours, I’m still not sure. Read on and decide for yourself. 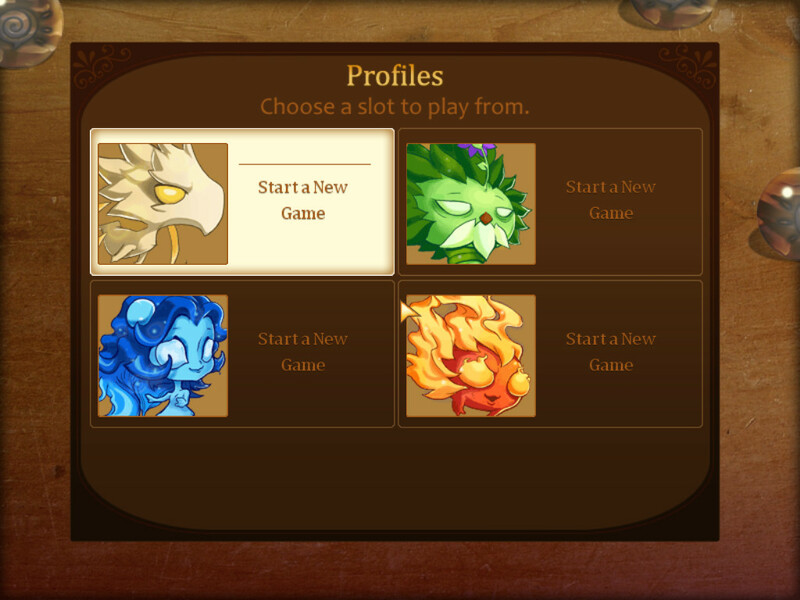 Later in the game, each color gets an emblem as well. I found the visuals of the game to be rather interesting. The typical gamefield is split up into two halves. The bottom half is a Bejeweled style grid of colorful orbs. Each orb is adorned with a fancy emblem along with its color to indicate what type of orb you are working with. Green has a tuft of leaves, yellow has a whirlwind, etc. Aside from adding a bit of detail, these symbols actually serve to make the game more accessible to colorblind people, a little thing that many developers seem to forget. The upper half of the screen is the battlefield. Rather than all of the action taking place on the board, with the presence of heroes and enemies serving as little more than window dressing, the battlefield in Legend of Fae features plenty of relevant action. The characters are represented by slightly pixelated sprites, they have the level of quality and detail of a high quality cut scene from the SNES days. Most actions that you take, and all actions taken by an enemy, are illustrated in the battlefield. 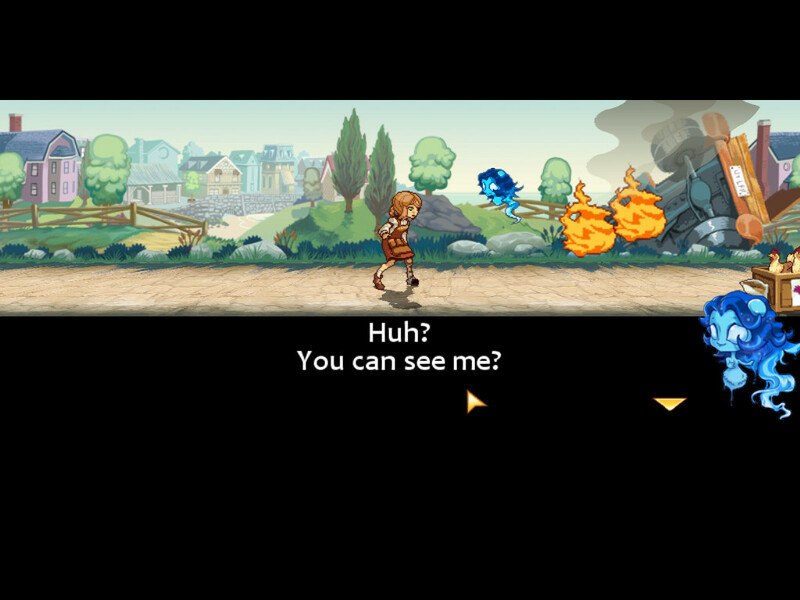 Your attacks are projectiles that sweep across the screen, and later have much more epic effects as well. Enemies return fire with their own animations. 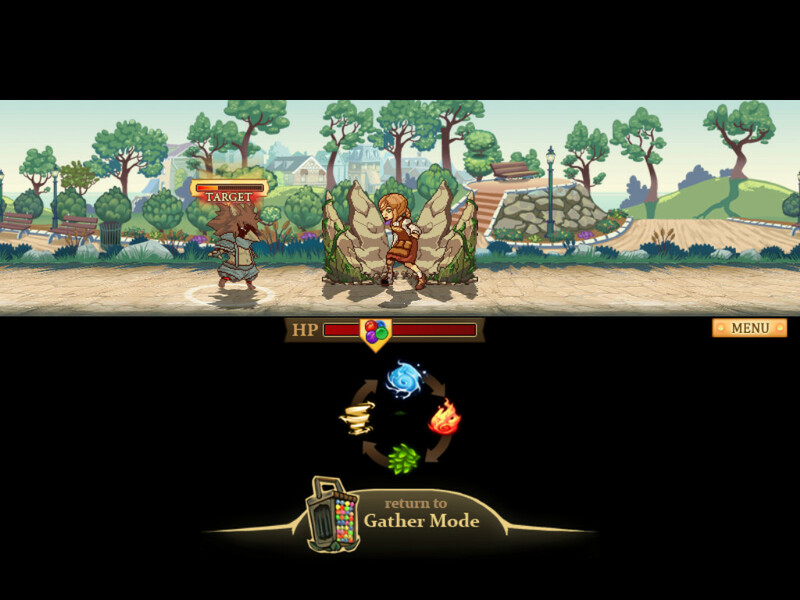 Current target, current enchantments, attacks that are ready, and enemy status are all clearly illustrated on the battlefield with blinking indicators, swirling icons, and animations. For a game with so much going on, a great deal of effort appears to have been put into making sure that the most important info is easy to find no matter what part of the screen you are looking at. 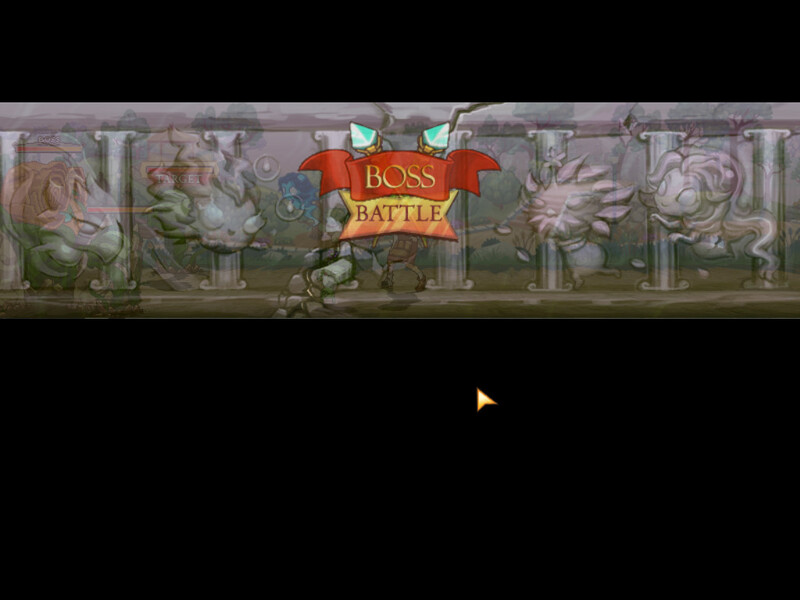 Some status effects change the appearance of the entire screen, like blind, which darkens the battlefield and makes all orbs look the same, or poison, which infects certain orbs and causes our hero to look clearly under the weather. 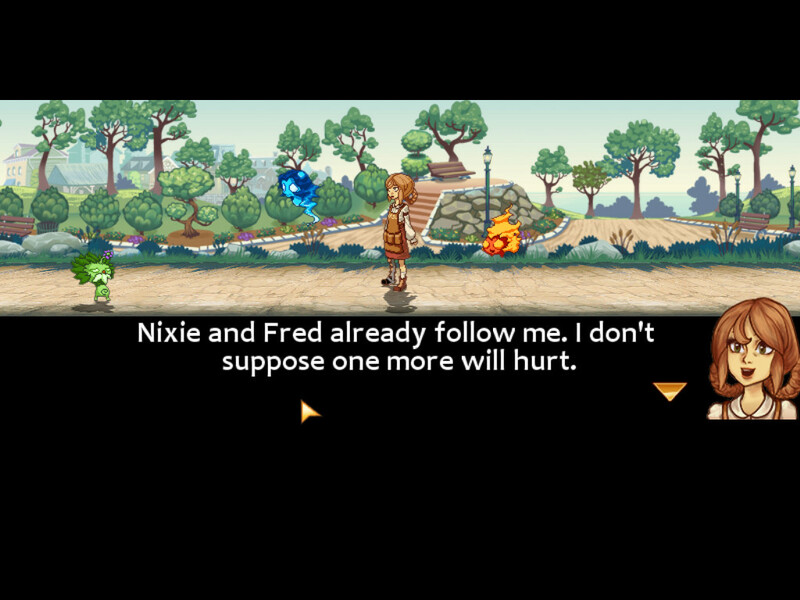 That's nixie. Because I'm a geek, I always think of a pre-LED digit display when I hear that word. Speaking of our hero, the characters in this game are interesting and well designed. Each element gets its own suitable avatar. Wind gets a bird, and earth gets what looks like the granddaddy of all pikmin. The enemies are extremely creative, well crafted, and widely varied. Even the fantasy standards, like dragons and fairies are given their own distinctive styles. 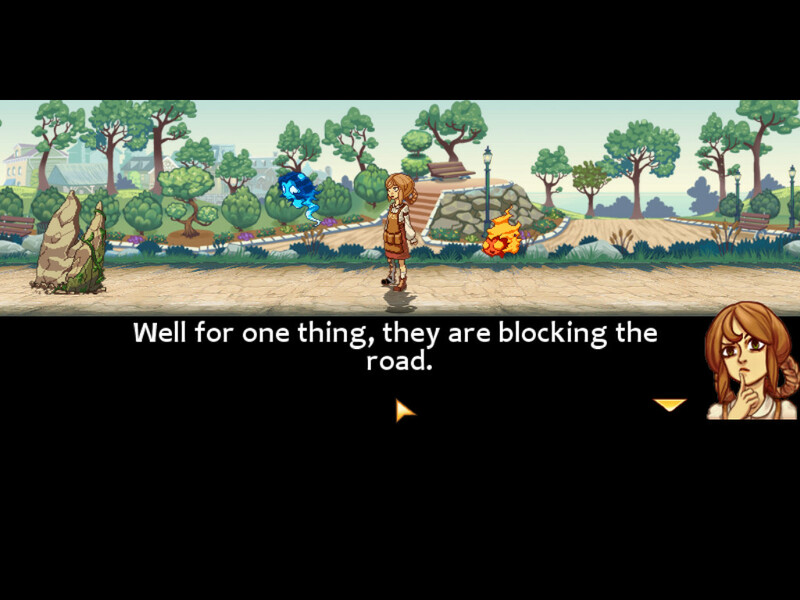 When more important, story intensive portions of the game come up, the visuals get an upgrade, with the pixelated renditions of the characters getting more detailed illustrations beside the captions to show the appropriate emotion for each line. Looking at these screenshots, you are probably thinking “Oh, I’ve played games like this.” This is true, but not in the way that you mean. Yes, there is is a grid of colorful orbs, and yes, you need to match colors. You can only swap the position of two horizontally adjacent orbs, and once you match at least three, they vanish and more drop in from above to replace them. Gathering the different elemental colors powers up the different elemental attack meters, and once they are full, you can unleash the associated attack. 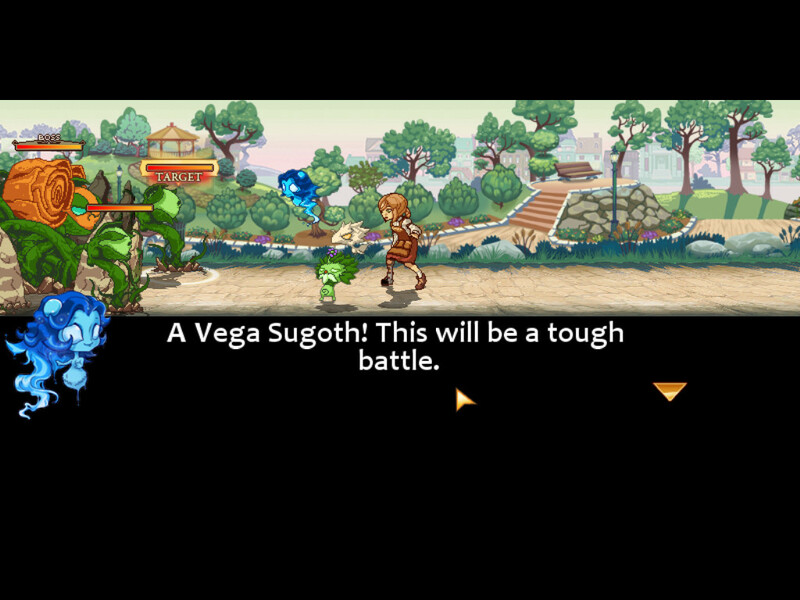 So far this sounds pretty much like Puzzle Quest, which at a glance this would appear to be a shallow duplicate. And it would, except that isn’t nearly the end of the gameplay. I love a tutorial that comes with handy pictures. Let’s move to the top half of the map. You are surrounded by enemies. These enemies have elemental alignments, thus providing them with a rock-paper-scissors sequence of strengths and weaknesses. Attacking with the element that they are weak against does a critical hit, attacking with their own element could do little damage, no damage, or even HEAL damage. You can raise defensive walls, as can the enemies, and there are status ailments like blind, poison, burn, etc. In order to pick, you ready an attack, select a target, and select the attack. After enough battles, you are given items that you can use to upgrade your attacks. Now it sounds like a standard RPG, and it is, but that still isn’t the end of it. 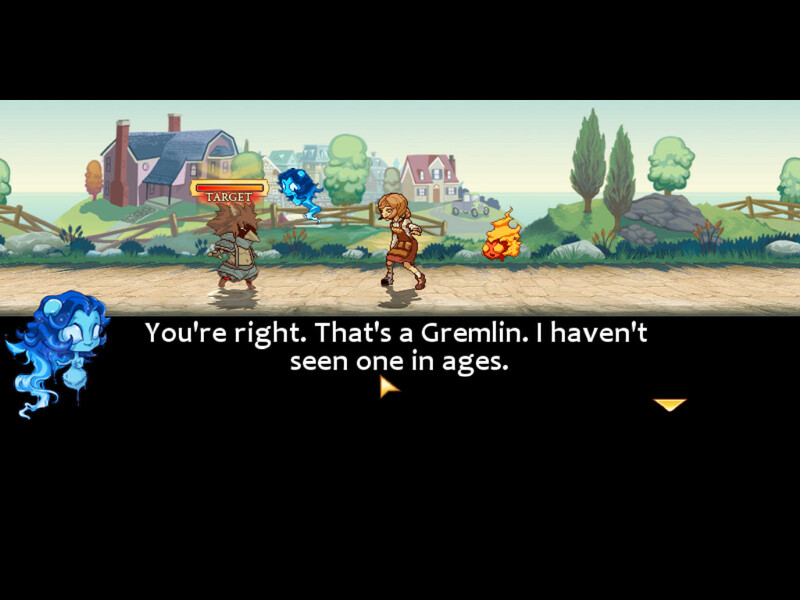 The real genius of this game is the way that the RPG and Casual elements interplay. For one, absolutely everything is the result of orb matching. Outside of battles, you need to collect purple orbs to actually walk along the level. Inside a battle, those same orbs ready up a dodge so that the next attack won’t connect. Status ailments are cured either by waiting them out (for some) or by collecting enough focus orbs to release a mind orb onto the battlefield. Clicking this clears the ailment. The blind status effect is one of the most clever. On the battlefield, it darkens things to near blackness. Since enemies must be selected to be targeted, and attacks are unleashed by clicking the appropriate elemental around you, not being able to see the field makes battle pretty tricky. You thus would want to clear the ailment right away, which means matching focus gems. The good news is that focus gems are still clearly identifiable on the orb grid. The bad news is that every other orb is featureless and black. If you’ve got plenty of them, then you’ll have a mind gem in no time. If you don’t have enough, or they aren’t close enough, you’ve got more problems than you realize. The "strength vs weakness" diagram was a useful addition to the screen. One problem is the danger that this poses to your chain bonus. You see, each time you match an orb, the game keeps count. 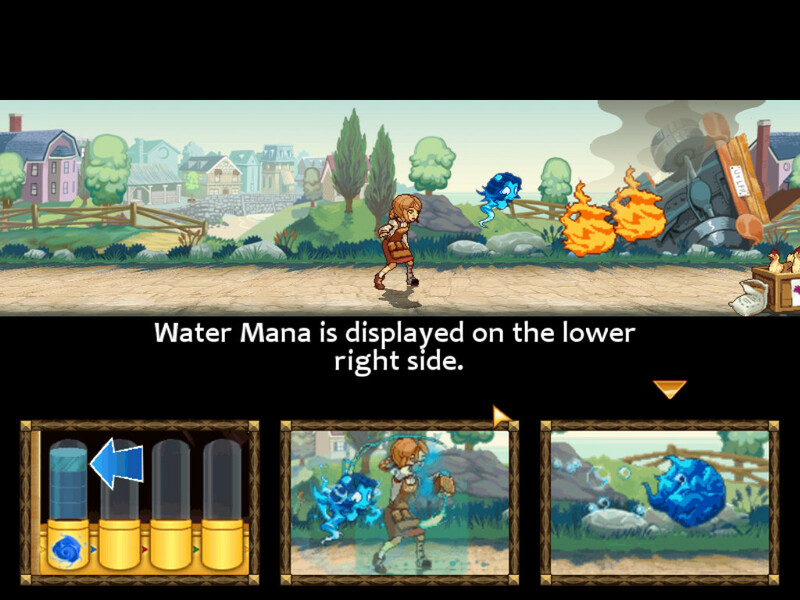 Matching orbs with successive moves increases the counter and accumulates effects. The longer the flawless chain, the more boosted your attacks are. If you keep the chain high enough, even your level one spells should be able to one-hit the enemies, and high levels spells will kill whole screens. If you are blinded, though, you are almost guaranteed to make a wrong move and drop your chain, and bonus attack, back to zero. Other effects, like burn and poison, do damage to you by infecting certain gems. The more gems affected, the more damage you take. Most of the time the gems also change appearance in a way that makes them harder to identify, once again threatening that all important combo. 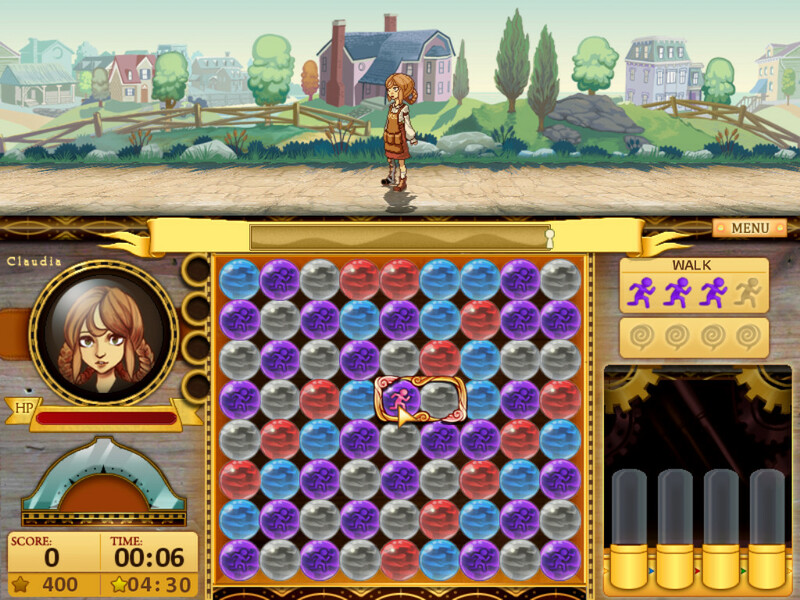 As you progress through the game, the strategy needed to beat the levels increases. Flying enemies must be knocked to the ground before any other elements can attack. For creatures like the fairies, which can switch elemental alignment mid battle, this may lead to situations where the only way to attack is with wind, but doing so will wipe out any past damage you’ve done, making a followup critical very important. 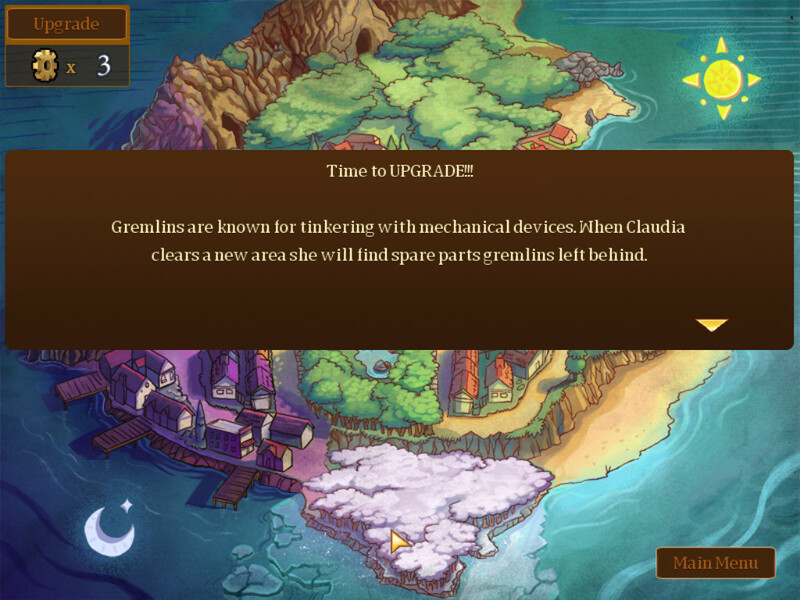 If you use your upgrade items correctly, you will begin unlocking higher level attacks, which can be decisive in winning or losing battles, but utilizing these attacks requires you to accumulate more mana. That same mana is also used for healing you if you are getting low on health, so in the longer battles, you’ll find yourself rushing to get the meters up as quickly as possible to score a knockout punch while the opportunity exists. Decisions of what enemy to attack, when, and on which side all factor into your success or failure. Do you drop the combo to maneuver wind orbs together so that you can knock down that harpy? Or do you keep the combo going, waste an earth attack just to raise a shield, and hope wind will drop in to better positions soon? Hell, even outside of battle you have decisions to make. Any attacks readied before the battle begins can be held onto, thus letting you enter the battle armed to the teeth, or activated early, thus applying enchantments that help you passively throughout the battle by increasing mana earning, regenerating health, or things of that nature. This being a color matching game, score is always a factor, and time is important too, since scrambling to get matches quickly is 80% of the game, but just to up the ante even more and keep you flipping gems like a maniac, each level has both an expert score AND an expert time. 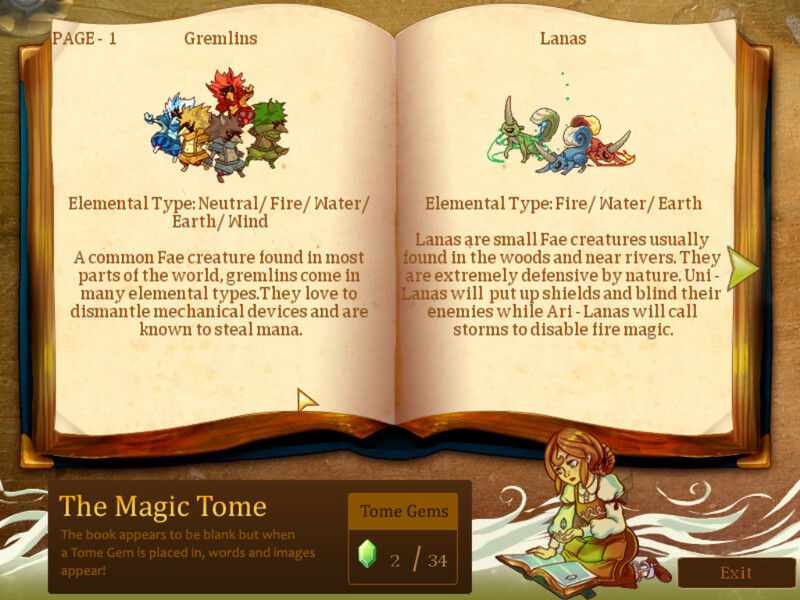 Meeting both values gets you an expert rating on the level and a tome gem, which adds a page to what I refer to as the game’s “pokedex.” Such gems can also randomly drop from enemies, along with health items and spare orbs. Clicking these items picks them up, but you have to do it before they vanish. 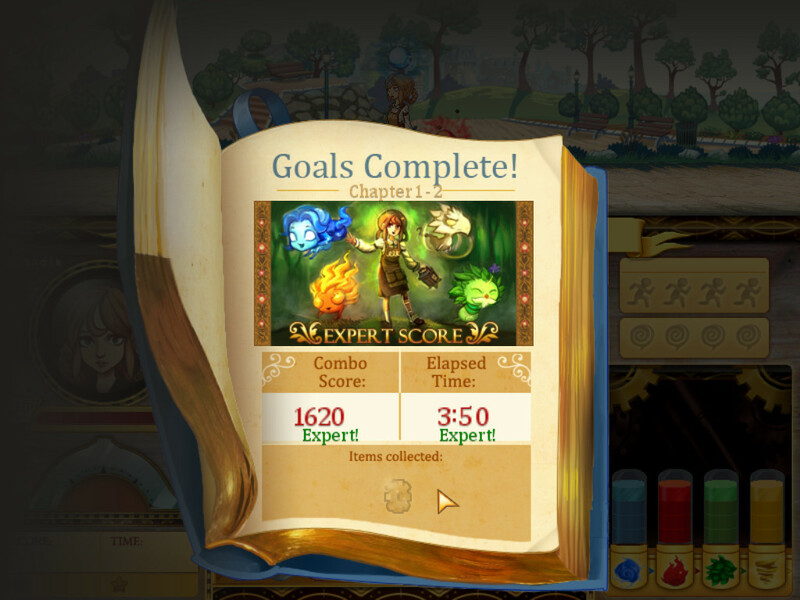 Before long, those expert levels become highly challenging to reach. If you’ve read many of my reviews, you’ll know I’m not a sound guy. This game’s audio does what it needs to. Attacks becoming available are indicated by the characteristic vocalizations of the associated elemental, low health and other statuses are indicated by a chime, bong, or tweet. The music is soft and calming or spirited and rousing as appropriate. Nothing stood out as great, but nothing was lacking either. 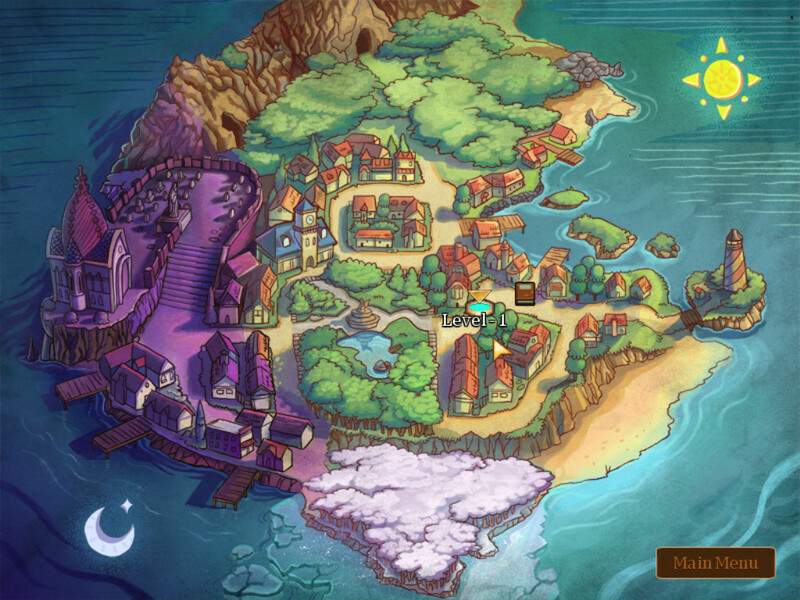 Whereas in other aspects of the game, the Casual and RPG elements are tightly coupled, the story is 100% RPG. 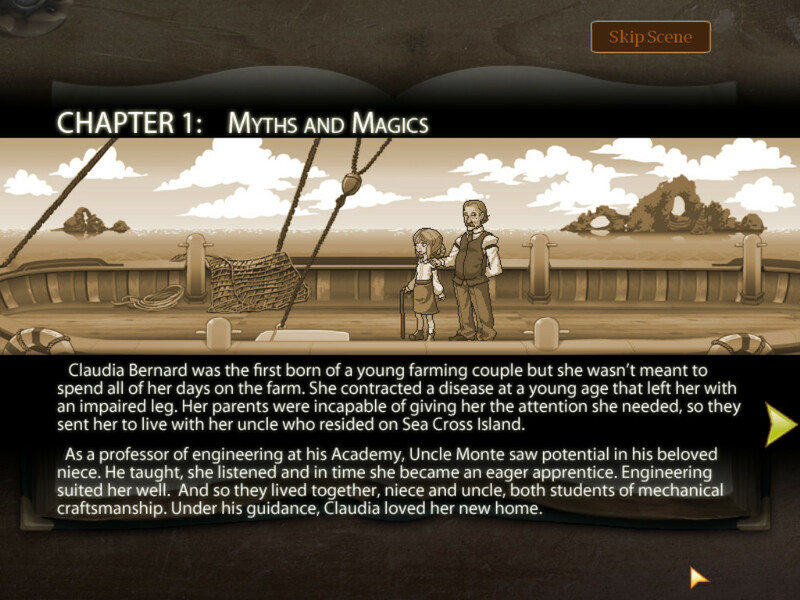 You play as Claudia Bernard, a young girl who was forced to move in with her Uncle after a debilitating illness left her with an impaired leg. This is anything but a tragedy to her, as her Uncle’s academic pursuits are a much better fit for her own interests. One day she wakes to find her Uncle mysteriously gone, having left a note informing her to go back to the farm for her own safety. Rather than running away, she decides to look for him, taking with her the strange lantern like object he had been working on. Quickly she discovers that the lantern is a tool that lets her use magic, and thanks to its influence, she can see mystic creatures unseen by others. Some, like the elementals, are friendly and helpful. Others are hostile. The meat of the story is told in this manner. 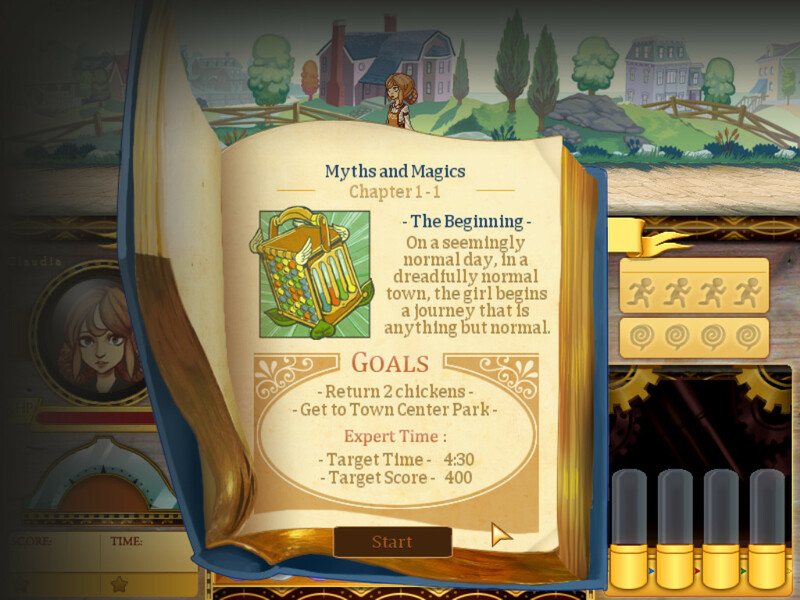 So the story begins, told mostly in pre-level conversations and supplemented by longer story chapters. I’ve played games with deeper stories, but the developers did an excellent job creating personalities and developing characters as the tale progressed. I’ve played plenty of games that tried to combine RPG and Casual aspects, but I’ve never played one that kept things this fast paced on both sides of the coin, and joined them together so tightly. It feels far too deep to be a casual game, it has too much puzzle to be an RPG, and has more intensity and strategy than you would normally find in either. I really don’t know what genre this belongs to. Really well done. 8.4 / 10: A fast and skillful blend of RPG and Casual color-matching that is more than the sum of its parts. The “strength vs weakness” diagram was a useful addition to the screen. That’s nixie. Because I’m a geek, I always think of a pre-LED digit display when I hear that word.